Healthy Living is a quarterly series taught by MYoga instructor Baxter Bell, M.D. that deepens our understanding of your amazing body while learning how yoga can support healthier living and aging. The Healthy LIving Series works methodically illuminates the healthy workings of our body from the ground up, beginning at the foundation of the feet through the knees, hips, lumbar spine, to the neck/shoulders. Baxter teaches yoga anatomy in advance/teacher training programs throughout the country and contributes to a regular column in Yoga Journal magazine, Doctor's Orders (http://blogs.yogajournal.com/doctorsorder/.) In addition Baxter is an advocate for healthy aging advocate for healthy aging through his blog at www.yogaforhealthyaging.blogspot.com. Many of us hold most our physical and mental/emotional tension in our neck and shoulders. Learn basic anatomical structure and how to open and strengthen this important yet vulnerable area of the body. We'll look at common conditions such as neck arthritis and rotator cuff strains. Not appropriate for students with acute or flared injuries. The demands of our computer dominated work can lead to repetitive strains of these precious structures. We'll take a therapeutic look at the elbows and wrists, learn about their anatomy and function, practice yoga asana to strengthen and mobilize the joints and address common problems. Not appropriate for those with acute or flared pain in either joint. This workshop focuses on the foundation of our structure, the under-appreciated and overused foot and ankle. We'll learn about healthy feet and how to work with troublesome conditions of the foot and ankle that can result in instability and issues in related joints of the body. When you really look at these spindly knees, holding up the rest of the body and moving us around, you can't help but be amazed! We'll not only get to know the knee joint and supporting muscles and structures in this session, but find new ways to please our knees, so we can keep 'em healthy or heal 'em up! Students often request "hip openers", but what does that really mean? And is it healthy to "open" the hips, which have more of a role in support for human function? These questions and more will be addressed, from the perspective of structure, function and therapeutics. 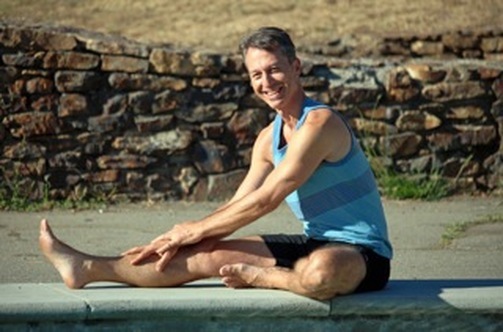 Baxter Bell, MD, RYT 500 has been actively deepening his understanding of yoga and relaxation since making the stress-reducing move from a career as a busy family doctor to that of a yoga teacher and medical acupuncturist. He is currently involved in the integration of therapeutic applications of yoga with Western medicine, lecturing to health care professionals around the country, adding Hatha yoga asanas and pranayama to his care of patients in his medical acupuncture practice, and teaching Experiential Anatomy for several Teacher Training programs around the country, including a new Therapeutic Yoga Teacher Training program at the Niroga Center in Berkeley, CA.